WHAT FREEMASONRY IS . . .
WHAT FREEMASONRY IS NOT . . .
To become a member of this ancient and honorable Fraternity, a man must apply of his own free and with an open heart. Invitations are not issued to prospective members, nor are members solicited. If a person is interested in joining, he should ask a Masonic friend for more information or contact the Grand Lodge of Virginia. The requirements for membership are; that you be a man, one of good character and reputation; that you be a peaceful citizen, and one who guards against intemperance and excess; and that you are one who respects genuine brotherhood and general good of society. Freemasonry requires a belief in a Supreme Being. We believe in service to those who are less fortunate. We believe in helping young people get a head start in life. Some people are. Somehow they consider us a secret society. Yet we don't hide our purpose or our membership. Our constitution and regulations are open for all to see. Masons provide homes for the elderly and for orphans. We provide college scholarships to promising young men and women. We contribute to blood banks, fund medical research, and maintain hospitals for crippled and burned children. That's why it's not surprising that some of America's greatest men have been Masons. George Washington was one of 14 U.S. Presidents who were Masons, as were five Chief Justices. Masons are soldiers, like General Douglas MacArthur; businessmen, like Henry Ford; entertainers, like John Wayne, Gene Autry and Roy Clark; astronauts, like Wally Shirra and John Glenn. We come from every walk of life. And we stand tall, proud to be called Master Masons.
. . . A band of brothers linked together by an indissoluble chain of sincere affection, forged link by link through the binding effect of a shared experience in the great lessons taught in the Craft degrees.
. . . A Fraternity of morality, founded on the allegorical application of the tools and implements of architecture to the construction of our personalities - buildings of living stone, in the service of God and Mankind.
. . . A descendant of the ancient Craft of stonemasons, builders of the great cathedrals and churches of the Middle Ages, structures so magnificent that the Holy Church itself declared them to be designed by God alone, as the "[Grand] architect of the universe."
. . . Not a religion and offering no promise of salvation, but a Fraternity seeking to inculcate in its membership love for God and our fellow man, by the practice of the principles of brotherhood, relief, and truth.
. . . Not wedded to any one religion, though it requires of its members a belief in God and the Holy Bible always remains open on the altars of its Lodges. It expects of a member devotion to the religion of his choice, believing, above all, that the path to salvation is better left to one's personal conscience rather than to the rigid imposition of another's beliefs.
. . . Nevertheless frequently called the "handmaiden of the Church," for the principles which it seeks to inculcate in the individual are common to all the great religious faiths. The Fraternity, by its teachings and examples, seeks to make of every brother one who is more amenable to the dictates of his religion, whatever it may be. Thus, it unites in the Brotherhood of Man Christian, Jew, Moslem, and Buddhist, who set aside their differences in seeking to serve God and their brethren.
. . . Charitable. Freemasons in North America give over two million dollars each day to charities in and out of the Fraternity. To relieve the distressed is a duty incumbent on all of us. From the great Crippled Children's Hospitals and Burn Centers to the Orphanages and Masonic Homes of our various States, from the Knight Templar Eye Foundation to the specialized charities of the Scottish Rite and Royal Arch Masons, Freemasons freely give of their earnings to help others escape the bonds of poverty, loneliness and despair.
. . . All of the above and more. It is truly a system of morality, veiled in allegory and teaching men by symbols to better themselves in their religious bodies, their communities, and their families. It gathers under its umbrella men of all faiths, all nations, and all classes without distinction - save that noble distinction, "of who can best work and best agree."
. . . The World's oldest fraternal organization. It has persevered through the years, despite the attacks of the ignorant and the powerful, because it teaches toleration for all faiths, acceptance of all men of good character, and support of free government institutions, wherever found. 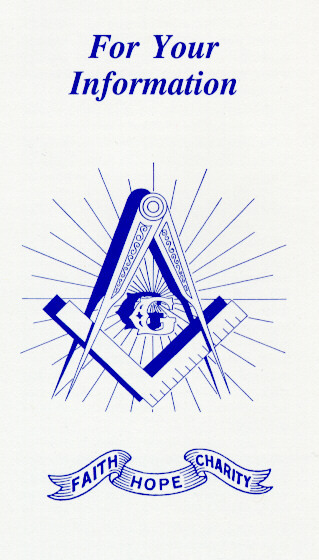 Freemasons are loyal citizens, support a God-centered life, and emphasize man's duty to aid his fellow man. If you are interested in learning more, your can contact the Grand Secretary of the Grand Lodge of Virginia at glva@web-span.com and he will make arrangements to have a Masonic Brother contact you to answer your questions.